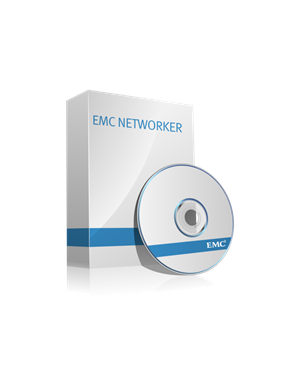 EMC Networker 8 is here! Today we’ll review how NetWorker delivers backup and recovery for VMware, and with several options helps companies protect VMware installations at every stage of adoption—from small deployments to large data center operations. In the slides ahead you will learn more how EMC BRS has the best solutions for virtualizing business critical applications and meeting backup and recovery SLAs. One technology, more than any in recent years, that is driving new efficiency in backup and recovery for virtual environments is deduplication. It is the key to transformational and effective VMware backup. Deduplication helps relieve resource contention by minimizing the backup data traversing the virtual infrastructure. It can also help to make managing greater numbers of virtual machines easier, at least when it comes to data protection, since a lot less data has to be backed up. And of course, deduplication will help to curb backup storage growth. In fact, because of redundancy within and across virtual machines, achieving 40–60-percent deduplication for backups of VMware environments over time is common. Finally, deduplication can make replication for disaster recovery a lot more feasible and affordable, and offers an opportunity to displace tape for VMware backup and recovery. The bottom line: EMC is the leader in both virtualization and deduplication. These are two synergistic technologies, and using them together to provide top-notch data protection is something that EMC is uniquely able to bring you. NetWorker helps organizations control costs by bringing management and control of the entire information environment into one central offering. NetWorker leverages this centralized, broad protection to bridge the gap between traditional backup and deduplication backup and enables new backup technologies to be introduced nondisruptively into complex IT operations by providing a common platform for both. 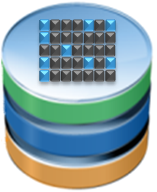 •Has industry-leading data deduplication support through integration with EMC Avamar and EMC Data Domain. 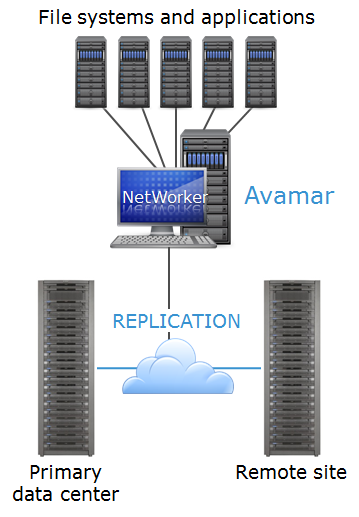 By leveraging Avamar and Data Domain deduplication, NetWorker helps users reduce the amount of data to backup and dramatically reduces the amount of disk storage needed to retain and protect data—without adding administrative complexity—by providing a common management interface and backup workflow. •Provides advanced backup-to-disk capabilities, snapshots, replication, NAS backup to disk, and backup to disk with vault to cloud. •Delivers enterprise performance, security, and analytics. –Simply put, nothing securely backs up, recovers, and scales like NetWorker. –Integrates with EMC RecoverPoint for continuous data protection (CDP) and continuous remote replication (CRR). •Provides better recoverability from tape backups by leveraging a future-proof open tape format with better recoverability from damaged tape media. Managing Avamar and Data Domain with NetWorker couldn’t be easier. Based on your requirements, NetWorker provides the ability to enable deduplication based on policy where and when you need it. The NetWorker solution is built on industry-leading solutions with Avamar and Data Domain. And because it is an integrated software and hardware solution, it is simpler to use, gives you more predictable operation, and is easier to support. The common, combined NetWorker and Avamar client allows deduplication to be defined through standard NetWorker backup client configurations in NetWorker Management Console for file systems and application modules. This includes support for Microsoft Exchange, SQL Server, SharePoint, and Hyper-V as well as Oracle, SAP, DB2, Informix, Lotus Notes, and Sybase. This support is applicable to both physical and virtual environments. NetWorker’s support is ideal, especially for existing users, because it does not force users to learn a different workflow or GUI. And because users may wish to deploy and manage a mix of traditional and deduplication backup, NetWorker allows the backup client to have both deduplication and non-deduplication or traditional backup jobs defined. By allowing the components of the deduplication solution to be managed through NetWorker Management Console, it helps users simplify operations. Results of client backups with or without deduplication are available through common NetWorker Management Console reporting and monitoring tools. •Recovery of any client and any data is possible through common recovery interfaces—graphical or command line. Here’s a high level look at how Avamar works. 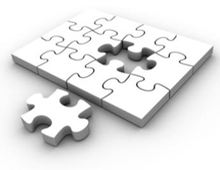 Avamar starts by dividing data into variable-length sub-file segments, it compresses them, and applies a unique hash identifier to each one. Then it can determine if that segment has ever been backed up before or whether it‘s unique and in need of being backed up. If the data has been backed up previously, either from this client, or any other physical or virtual client, then Avamar will not back it up again. This is why we say, ‘never backup the same data twice’…. Using this process, Avamar routinely reduces data by up to 99 percent before backing it up. This can have a huge impact. Also, the data that is truly new and unique is sent across the network compressed, which again helps with bandwidth management on both backups and recoveries. It is also encrypted, which ensures the security of the data while its in transit as well as when it is at rest. Data Domain deduplication storage systems dramatically reduce the amount of disk storage needed to retain and protect data. Data Domain is ideal for use with existing NetWorker disk-based or virtual tape library (VTL) capabilities. The combination of NetWorker and Data Domain allows for centralized, automated, and accelerated data protection across your enterprise. Another advantage of Data Domain is that it can be deployed quickly and fits into current backup workflows and policies. It provides an alternative to disk and tape volume pools and is optimized for sequential read and write operations. With Data Domain Boost capabilities, users will get advanced capabilities when using NetWorker and Data Domain together, including improved performance, clone-controlled replication, automated configuration, and monitoring and reporting. 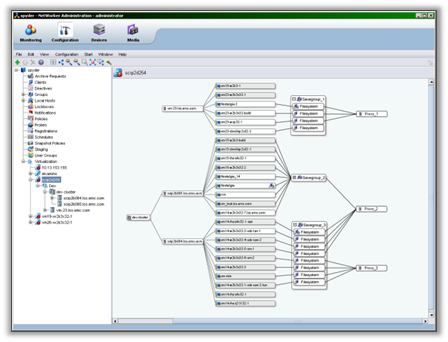 This integration optimizes the interface between the NetWorker and the Data Domain storage system, and distributes part of the deduplication process to NetWorker storage nodes/servers and application clients protected by NetWorker Module for Microsoft Applications 2.3 and higher, NetWorker Module for Databases and Applications 1.2 and higher, and the NetWorker Module for SAP 4.2 and higher. Application hosts include Microsoft Exchange, SharePoint, and SQL Server; DB2; Informix; Lotus; Oracle; Sybase; and SAP. 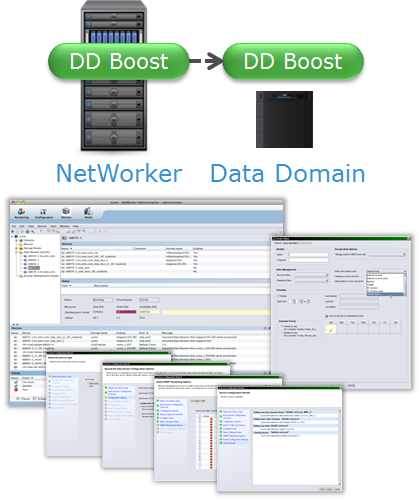 New for NetWorker 8.0 is the ability to run DD Boost on the NetWorker client itself. This is for protection of file systems as well as VADP proxies and expands all the benefits of deduplication for the NetWorker client. One difference to point out with DD Boost at the application client and NetWorker client compared to the storage node support released with NetWorker 7.6 SP1 is that the segment processing is happening from the backup client—not through a storage node. DD Boost enables efficient data transport over the LAN directly to a Data Domain system. This is driving new efficiency for NetWorker customers who use Data Domain. This is outside of a storage node or dedicated storage node implementation so there’s no requirement that the module client be a storage node to use DD Boost. 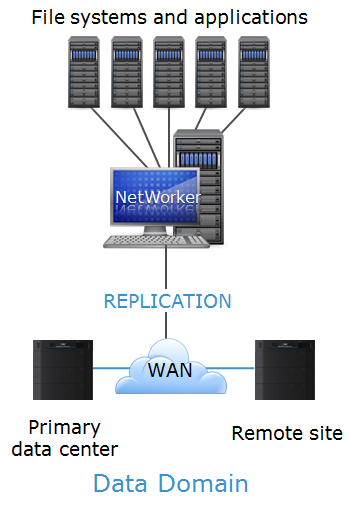 The Data Domain replication process is managed by standard NetWorker cloning, ensuring that NetWorker can recognize and manage a replicated (remote) copy of data and assign unique retention policies to it. This can all be scheduled to run at the times chosen as most appropriate by the administrator. NetWorker Management Console provides wizard-based tools to simplify the deployment of the solution and simplify the configuration of backups to Data Domain. 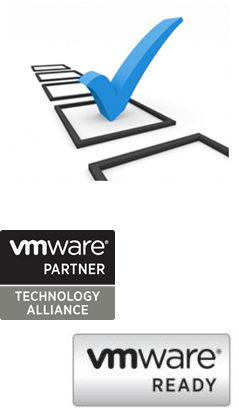 NetWorker supports VMware’s latest release of vSphere 4 and 5. It offers several protection options that help companies, regardless of their current adoption level of server virtualization. Key to VMware backup is deduplication. You can deploy LAN backup of individual virtual machines through the NetWorker client and application modules. This is just like you’re accustomed to doing in your physical environments, but translates to the virtual guest. It offers granular protection of file systems for all supported operating systems, and also enables application-consistent backups by communicating with the applications running in the virtual machine. With the VMware vStorage API for Data Protection (VADP), NetWorker is able to deliver off-host protection of virtual machines in the vSphere Server infrastructure. Also supported is Data Domain Boost Software on the Proxy Server. You gain the benefits of deduplication including faster backups and reduced network traffic with DD Boost and Off-Host protection. 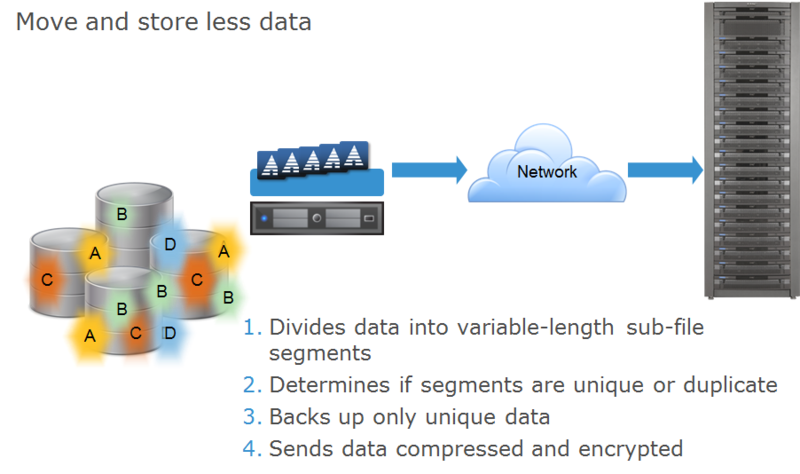 It’s important to note that NetWorker not only delivers the flexibility to choose how you’ll back up your data on VMware, it also provides a choice of using traditional backup methods—backup to tape, backup to disk, backup to virtual tape—and supports the choice of deduplication backup for the VMware environment. With guest-level backup, the NetWorker client can be installed on each VMware guest and protect each virtual machine—just like protection is achieved for physical machines. This is generally very easy to do, and for companies who want commonality in installation and workflows, this can be a useful option. For virtual machines running applications such as Microsoft SQL Sever, Exchange, or Oracle, a NetWorker application module can also be used inside the guest to achieve application-consistent or restartable backups. The main advantages of VMware guest backup are that it allows for support of partial or file-level restores and lets users leverage identical backup methods for physical and virtual machines. There is no requirement for advanced scripting or VMware software knowledge—this means unchanged day-to-day procedures for backup. The application consistency that is typically a requirement for production applications is also delivered today through this method. Guest-level backups have been qualified in conjunction with VMware Distributed Resource Scheduler, vMotion, and High Availability—solutions that allocate virtual machines based on demand or move virtual machines for business continuity and disaster recovery. As virtual servers move, NetWorker is still able to backup and recover as needed. For file systems and applications, NetWorker can support both traditional and deduplicated backup operations, providing choices and options to meet your requirements. NetWorker 7.6 SP2 and higher delivers integration with the VMware vStorage API for Data Protection. This is a replacement for the previous VMware Consolidated Backup (VCB) framework. VADP provides the facility to centrally and nondisruptively back up VMware vSphere Server hosts from a central proxy server. During backups, NetWorker asks VMware through the API to create a snapshot of virtual machine data directly from the VMware datastore. The snapshot is then mounted and the data is copied directly to the storage media. The difference between this implementation and the VCB implementation is that VADP does not require dedicated disk cache on the proxy server and requires fewer resources, thereby improving backup speed and allowing more virtual machines to be backed up simultaneously. Now through VADP, similar to what NetWorker has been able to do through VCB, a single backup is able to deliver both a virtual machine image-level recovery as well as file-level recovery. This saves time by eliminating the need to backup two different ways to achieve the desired level of recovery. Plus you can achieve incremental and differential file backups based on full-image backups. With VADP, the backup proxy can be either a physical or virtual server. This affords the flexibility to choose based on your requirements. For incremental backups, NetWorker uses the Changed Block Tracking (CBT) feature of the VMware API for Data Protection to identify and protect changed data. New for NetWorker 8.0 is the integration with DD Boost out at the NetWorker client. This includes the ability to run it on the VADP proxy server. You’ll see all the benefits of running DD Boost and deduplication (mentioned earlier) here on the proxy. NetWorker 7.6 SP2 and higher integration with the Changed Block Tracking feature of the VMware vStorage API for Data Protection allows NetWorker to quickly identify the data blocks on the virtual machine that have changed since the last backup. This eliminates the need to walk the file system to determine changed files, which results in faster backup time. Once the list of changes is understood, NetWorker executes file-based backup of the changed data. Where this will demonstrate the biggest impact is on active file systems that are very large and would otherwise have a significant and noticeable changed file discovery time. Changed Block Tracking lets NetWorker pinpoint what to back up. Two features available since the release of NetWorker 7.5 further enhance what you can do to help more effectively protect a VMware environment. NetWorker features VMware auto-detection to help simplify backup of VMware environments through a direct link to VMware vCenter Server. This allows NetWorker to automatically discover virtual machines added to your environment. If NetWorker determines that there are any new unprotected virtual machines identified by vCenter Server that do not have NetWorker client resources associated with them, a notification will be triggered. You have the flexibility to configure how often NetWorker checks in to see what’s changed in the environment. You can connect to and manage multiple vCenter Server systems as well. As VMware continues to proliferate into production, keeping track of new virtual machines can be a challenge. NetWorker’s integration with vCenter Server and auto-discovery prevents missing backups of new virtual machines—a growing problem in many environments. NetWorker 7.5 and higher makes it easier than ever to stay on top of your VMware environment through a new graphical representation of your virtual backup environment. This shows the relationship among NetWorker and the virtual environment, clusters, ESX servers, virtual machines, etc. You can see how clients are configured to run in the various backup groups. This is a great way to see whether adjustments to the environment are necessary. You can see if virtual machines are being protected at the guest level or through the vStorage API for Data Protection, and interactive controls (zoom, find, filter, etc.) allow you to customize the map to see what you want when you need it. You can also configure directly from the map by right-clicking and launch a configuration wizard. This especially helps simplify management of large VMware environments. NetWorker users can leverage any combination of the VMware backup methods, with or without deduplication, to craft a backup environment to suit their needs and recovery time and recovery point objective (RTO/RPO) requirements. No matter where your stage of adoption of VMware, NetWorker can provide an appropriate solution to help you best manage protection and recovery. NetWorker can help speed backup and provide offerings to protect the entire enterprise, from the data center to the remote office. And by combining capabilities into a single solution, NetWorker helps simplify the number and complexity of tools that are necessary to learn and use for backup and recovery. Previous Post Previous post: VMware View Storage Accelerator–The (extended) results are in! Next Post Next post: PowerPath/VE 5.7 P01 is out, grab it now!